As a vocalist, I performed for a number of years and it's easy to think someone just gets up and sings for 3 minutes and that's all there is to it, but there is a lot of work that goes on behind the scenes. You have to learn your craft. I decided to take a humorous look at a bit of the learning process required to work in the arts, in order to educate and entertain. Daisy De La Cruz desperately wants to be a famous actress. She’s good and she knows it. She has a beautiful voice and wonderful coaches at the school for the arts where she attends. She even has an agent who has helped her land a few commercial gigs. Her best friend, Tamika, also wants to be a star, but she lacks the confidence as well as Daisy’s vast vocal range. Competition is fierce at the school for the arts, and when a new music teacher introduces some novel ideas to his students, the competition just heats up and alliances change. And what middle school Grade 6 drama wouldn’t be complete without a mean girl queen? There are lessons to learn, though, and Daisy struggles intently with her dream, her desire to maintain her friendships, and her need to understand what’s right and good about both life and the world of acting. Author Melody Delgado has taken the mean girl middle school theme up to another level by introducing the world of highly competitive and often vicious art students. 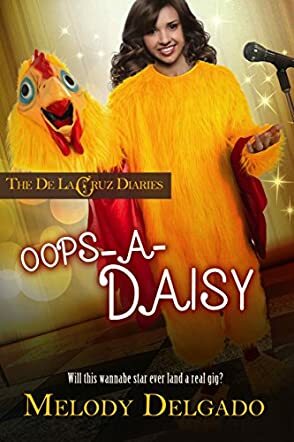 Her middle grade novel, Oops-A-Daisy: The De La Cruz Diaries, takes some rather complicated teenage themes and dramas and weaves them into valuable life lessons. The new music teacher, feared at first for his stern approach, becomes revered, at least by Daisy, as she learns why he insists that their class visit the local homeless shelter to help out. It gives her another perspective on life and what really is important. Although she can and will still dream about her acting career, Daisy has also felt compassion for helping others, both in the acting field and those less fortunate. A powerful story with an important message for young readers.